Also, Sylvester Turner airs first TV ad of Houston mayoral election, the field of potential CD-19 candidate winnows and presidential hopefuls keep flocking to Texas. Attorney General Ken Paxton is beefing up the team of lawyers defending him against his securities fraud indictments. Paxton's team announced Thursday it has added three attorneys: Philip Hilder of Houston, Heather Barbieri of Plano and Bill Mateja of Dallas. Hilder will serve as co-lead counsel with Dan Cogdell, who was named to Paxton's team earlier this month. Paxton's team now has five members: Barbieri, Cogdell, Hilder, Mateja and Terri Moore of Fort Worth. 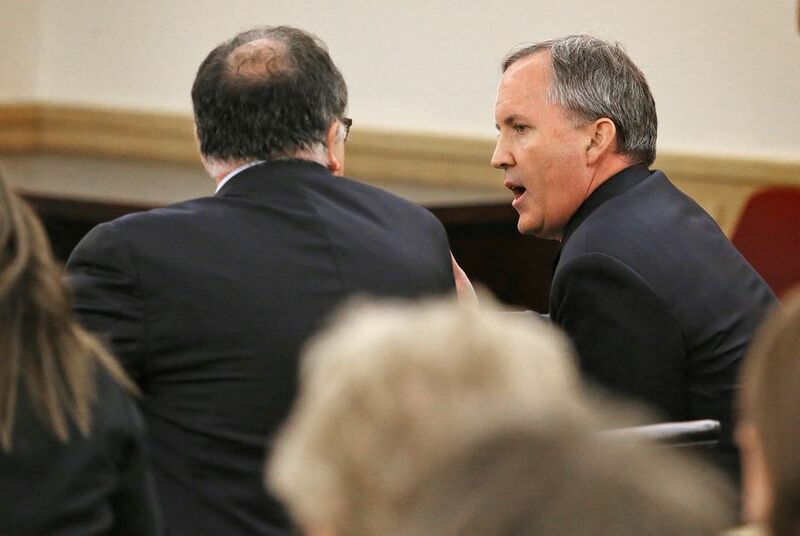 "I took the time I needed to assemble this five-person team of some of the best defense lawyers in the state of Texas," Paxton said in a news release Thursday. "My legal team will fight for truth and justice, and I will continue to fulfill my duties as Texas Attorney General which the people of Texas elected me to do." Paxton has pleaded not guilty to charges of defrauding investors before he became the state's top law enforcement official. There had been some confusion over who would represent Paxton after his former lead lawyer quit at his first court appearance in August. State Rep. Dustin Burrows, R-Lubbock, will not seek the Congressional District 19 seat, previously held by U.S. Rep. Randy Neugebauer of Lubbock. Last week, Neugebauer announced he would not stand for re-election to his seat in Congress. "Over the past few days, I have received several calls encouraging me to run for Congress,” Burrows said in a statement. “While I am truly honored and humbled by this support, I am committed to serving West Texas in the Texas Legislature. I look forward to working with our next Congressman for the betterment of West Texas and this Country." Retired neurosurgeon Ben Carson is returning to Texas next month for a book tour that will take the Republican presidential hopeful to eight cities in three days. Carson is hitting the road to mark the Oct. 6 release of A More Perfect Union: What We the People Can Do to Reclaim Our Constitutional Liberties. In Texas, the tour has stops Oct. 18 in The Woodlands and San Antonio; Oct. 19 in Austin, Bryan and Waco; and Oct. 20 in Fort Worth, Plano and Wichita Falls. Carson most recently visited Texas last week, when he spoke at an event for the Montgomery County GOP in Conroe. The 2016 presidential race brought two candidates to Dallas on Tuesday to raise money. Both U.S. Sen. Marco Rubio, R-Florida, and Democratic presidential frontrunner Hillary Clinton were scheduled to hold fundraisers in the area. The former secretary of state was initially set to headline a public event Tuesday in Dallas. Citing a scheduling conflict, her campaign announced last week it had to cancel the public event. On Tuesday afternoon, Democrats pounced on particulars about the Rubio fundraiser's host, who apparently collects artwork by Adolf Hitler. Jerry Jones hosted a fundraiser Wednesday night for New Jersey Gov. Chris Christie, whose embrace of the Dallas Cowboys owner earlier this year at a game went viral. The event will benefit Christie’s underdog presidential campaign. He last visited Texas in March to raise money in Dallas. Tickets started at $2,700 per couple. Ray Washburne, the Dallas investor who serves as the national finance chairman of Christie’s campaign, was also among the hosts of the event.